2004 U.S. Championship to be held in San Diego! 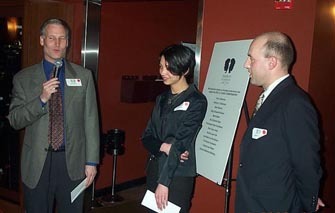 After hosting the widely successful 2003 U.S. Championship, Erik Anderson and the America's Foundation for Chess (AF4C) will move the 2004 tournament from Seattle to San Diego. AF4C will join with sponsor NTC Foundation to host the 11-day tournament which will boast a generous prize fund of $250,000. This year's field has been expanded to 64 players and the winner will represent America in the FIDE World Knockout Championships. "AF4C has been looking for a partner whose mission is aligned with ours: NTC supports creative education and believes in the value the U.S. Chess Championships can bring to the national expansion of the AF4C classroom chess curriculum," said Erik J Anderson, president and co-founder of AF4C. For those who attended the 2003 Championship, it was indeed a historic event in a magical atmosphere. This year's event hopes to showcase new talent in hopes of reaching a wider audience. Stay tuned!